There are many reasons why dogs are the best pets and deserve the title of man’s best friend. As a pet parent, not only do you get to enjoy their wonderful company, but you also have the responsibility to take care of your furry friend. Out of all the responsibilities that come with a pet dog, dealing with fleas is probably the one that pet owners do not like (or detest, if I may say so!). Why are Collars the Best Flea Treatment for Dogs? How to Use a Flea Collar? 1. Is using a flea collar alone enough to kill fleas? 2. Are flea collars safe for all dogs? 3. Do I need to remove the flea collar before taking my dog for a swim? They are comparatively safer – There was a time when flea collars were considered unsafe because they used strong and toxic pesticides. Due to low sales, most of the manufacturers carried out in-depth research and came up with safer, yet stronger and highly effective formulas. A large number of modern flea collars do not cause serious side effects and are considered safer than many oral and topically-applied medications available today. They are more convenient – Using a flea collar is very easy; no messy application or tricking your dog into eating their food with a pill. Simply pop a flea collar on your dog’s neck and let it do its work. They offer longer protection – Even the most effective flea treatment product can only protect your dog from fleas for a maximum of 30 days. Most flea collars, on the other hand, offer months’ long protection with the best ones lasting as long as eight months. They are cost-effective – Most of the dog flea and tick collars are less expensive than oral medication and spot-on treatments, making them more popular among pet owners. Collars that emit insecticide in the form of gas to kill fleas. While these collars are less expensive, they are not that effective and only kill the adult fleas that are close to the collar. These types of collars are also not much effective at killing flea larvae and eggs. In addition, they may also cause side effects. Collars that continuously release liquid insecticide, which gets absorbed into the natural oils and spreads to the entire body of the pet. These chemicals not only kill fleas, larvae, and eggs, but also repel them by adhering to the dog’s skin and hair. This means your dog is protected against re-infestation for months. These collars are also safer than the gas ones. While gas collars are less effective and risky, they are more widely used because of their over-the-counter availability and affordable price. To help dog owners out there, we have prepared a list of the best flea collars for dogs for 2019. These dog flea collar reviews will definitely help you find the right product for your dog. 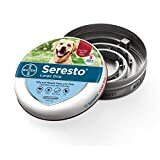 Available in two varieties for small and large dogs, Seresto is among the top rated dog flea collars due to its effectiveness and availability for small dogs. While other flea collars require a puppy to be at least three months old, Seresto is a safe flea collar for puppies and can even be put on those that are 7 weeks old. It not only kills fleas, but also works against ticks, lice, and sarcoptic mange. 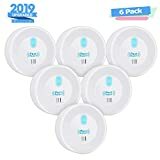 What makes it even more wonderful is the fact that it can also protect your pet from re-infestation by repelling these tiny parasites for up to 8 months. The collar also kills larvae and eggs of the parasites. Now we know why Seresto is one of the most recommended dog flea collars by veterinarians. The flea collar has a low concentration and continuous release mechanism. 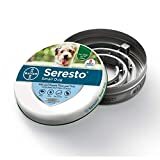 Unlike older formulas that get activated only after a parasite bites a dog, Seresto by Bayer kills fleas, ticks, and lice as soon as it comes into contact with them. The odorless and non-greasy formula makes this product super convenient. It is also the perfect flea collar for puppies under 12 weeks. NEW GERMAN FORMULA: MORE THAN 6 MONTH OF BEST PROTECTION-New German Technology gives you effective flea and tick prevention for dogs for 6 month! 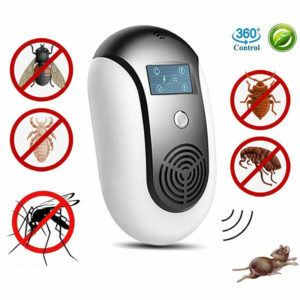 3D PROTECTION FOR YOUR PET - effective against Fleas - larvae - Ticks and Mosquitoes. This flea collar for dogs was designed to be HELPFUL either for small medium size or large pets. QUICK EFFECT - Rolf 3D Dog flea collar kills fleas within the first 24-48 hours after the start of use. Its main aim is to provide your pet with proper flea tick treatment & this flea tick collar does it well. KNOCK DOWN EFFECT - TESTED BY THE BEST VETERINARIANS: new German formula was specially used in the best flea collar and helps to achieve the best results. 100% SAFE FOR YOUR DOG/CAT - non-toxic tick repellent that treats with care. Our dog flea medicine kills and repels fleas and ticks quickly and leaves them no chance to survive! No harm for dogs! No strange smell! A relatively new addition to the dog flea collar range, Rolf Club 3D is comparatively more affordable than other dog flea collars. It comes in 3 standard (but adjustable) sizes, which makes it perfect for all sizes of dogs. What distinguishes this product from other flea collars is that it offers wider protection; the 3D collar also repels mosquitoes in addition to fleas, ticks, lice, larvae, and eggs. It’s also hypoallergenic and can be used on dogs with allergies and sensitive skin. 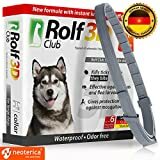 While Most of the ingredients present in the Rolf Club 3D collar are natural, including natural oils and enhanced plant extracts, it also contains fipronil. Fipronil is a non-toxic formula that is completely safe for your pet. The new German formula provides quick results. It starts killing fleas and ticks within 24 to 48 hours of wearing. EFFECTIVE: Using DYEOF Flea and Tick Collar is not only the effective but also economical way to save your furry babies from different types of flea, bug, tick and other pests. This product can work as greatly as the drops and pills but cost you cheaper. Simply put the collar in your dog's neck, the entire body is protected, especially, the neck region. DURABLE & COMFORTABLE PROTECTION: The new formula keep the protection effective in 8 months; therefore, you can save more time and money than using other medications. Your dog no longer has to suffer from itchiness and discomfort. Furthermore, this treatment collar is non-greasy and waterproof, no need to take it off when your dog has a bath or in outdoor activities. The length of the collar is 25″, it can fit for any types of dog from 8 weeks old. SAFE FOR PETS AND HUMANS: We commit of totally applying Natural Plant Extract for the collar to provide a reliable prevention for your pets. This eco-friendly and nontoxic product will not bring about irritation or allergies which normally happen when using collar with harmful chemical substances. PURCHASE GUARANTEE: We are confident to offer the best quality to our customers in terms of products and services. If you are unsatisfied with the collar, we will offer you a refund with no exception. Click the Add to Cart Button Now To Own This Amazing Product! WARRANTY & GUARANTEE: As a trusted brand as well as a pet owner, we are always trying our best to provide customers with the best services. If you are not satisfied with our dog flea medicine, feel to return it to us for a full refund. Free of toxic chemicals, hypoallergenic, and water-resistant, the DYEOFF flea and tick collar uses a combination of six highly effective ingredients (most of them are natural) to kill and repel dog fleas and ticks. While it has a couple of chemical-based compounds, they are not harsh or harmful. This means, the collar can be used on young dogs as well. THE BEST NATURAL FLEA AND TICK PREVENTION FOR DOGS! With the Arava premium natural flea and tick collar for dogs! Our botanical dog and puppy tick collar is here to help keep irritating fleas and annoying ticks away from your dog's or puppy's fur. It's 100% natural and active herbal ingredients and essential oils will add an extra layer of security around your four-legged friend and prevent itchy bites from fleas and ticks. For large, medium and small dogs! PATENTED MICRO-INJECTION TECHNOLOGY WILL KEEP YOUR DOG SAFE FOR 6 MONTHS! Unlike other low-quality tick and flea collars for dogs, we have utilized a UNIQUE Israeli patented Micro-Injection technology to infuse essential oils into the dog tick collar. As a result, the essential oils will be released via the special pores in the plastic using a Slow-Release process, which will make the natural tick and flea collar's effect last for more than 6 months! 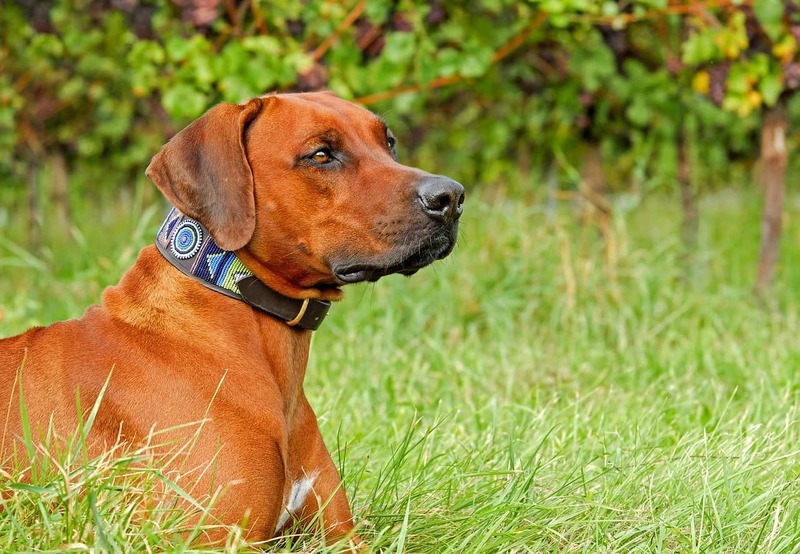 THE SAFEST FLEA & TICK COLLAR FOR DOGS IS FINALLY HERE! While other cheaply-made tick and flea collars use harsh chemicals or hazardous ingredients, you can rest assured that the Arava flea and tick control collar contains NO HAZARDOUS CHEMICAL PESTICIDES and is MSDS tested and FDA certified. That's why our waterproof and adjustable tick collar for dogs isn't only safe for your furry friend, but also safe for you and your children! SOOTHING NATURAL SCENT WILL REPEL TICKS & FLEAS FROM YOUR PET! Our waterproof and rainproof natural flea and tick collar for dogs has a light and soothing essential oil scent that will help keep fleas and ticks at bay. These natural essential oils are used in aromatherapy to promote relaxation and prevent diseases, so if you feel like the scent is overwhelming at first, you can leave the collar out for 24-48 hours and then use it on your doggy! 100% NATURAL FLEA & TICK PREVENTION FOR DOGS OR YOUR MONEY BACK! That's our unconditional guarantee! You can try our eco-friendly and adjustable natural tick collar for dogs for 30 days and if you're not 100% thrilled, we promise to offer you a prompt and full refund! Plus, we proudly donate a portion of our profits to charities that help protect the rights, welfare and habitats of animals. For more information on our donations program, you can contact us anytime! Packed with a combination of essential and base oils, the flea collar by Arava is all-natural, gentle, and non-toxic, making it the best flea repellent for dogs. The dog flea collar is also MSDS tested and certified by the FDA. This makes it perfectly safe even for little puppies as well as your own children (as per the manufacturer’s claims). Its 100% natural ingredients can keep your dog protected for up to 5 months by adding an extra security layer on its body. The company also provides 100% money back guarantee if you are not satisfied with the results. Important: Arava Flea and Ticks Botanical Collar only repels fleas and ticks. 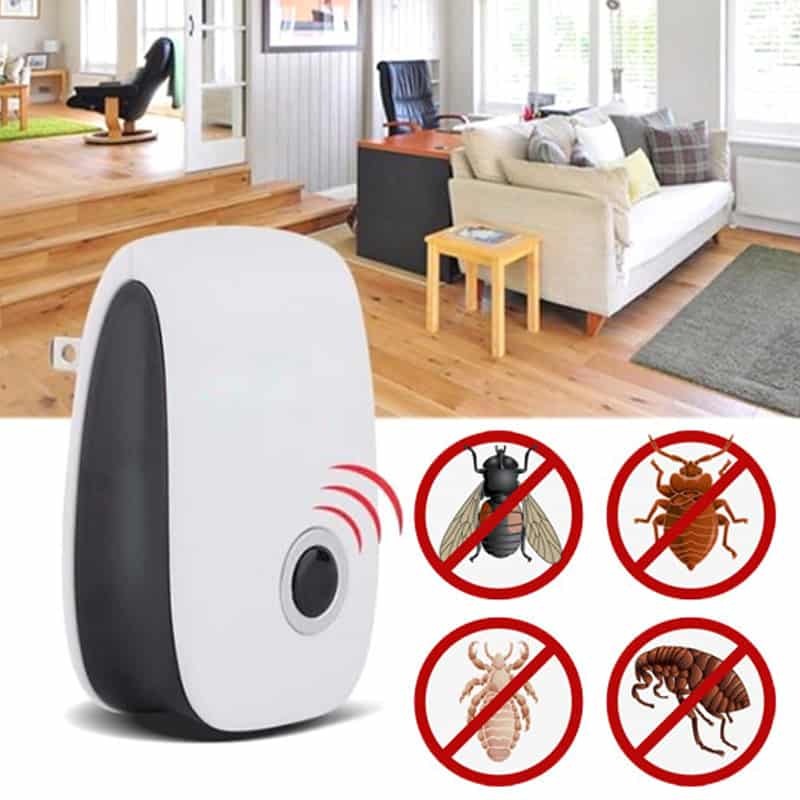 This means it only prevents flea infestation and is not a flea treatment. The manufacturer suggests using it with a flea treatment shampoo for best results. When it comes to pocket-friendly flea collars, Hartz Ultra Guard Flea and Tick Collar comes at the top of the list. 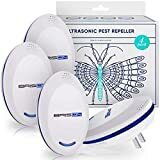 While it may not provide as quick results as other products in our list, it is a good choice if you are looking to prevent a flea infestation or if the problem is not severe. It has a fresh smell that won’t bother your pet. The adjustable strap makes the collar perfect for even bigger dogs – it can fit a neck of up to 26 inch. If you are looking to buy a dog flea collar that works, without breaking your bank, Hartz Ultra Guard Flea and Tick Collar is your best bet. 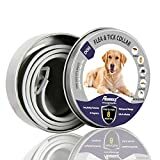 This flea and tick collar for dogs uses a combination of essential oils to remove as well as repel the creepy crawlies that live on your pet’s body. Therefore, it is the perfect choice for dogs that are sensitive to strong chemicals. The collar works against fleas, ticks, lice, larvae, and mosquitoes. With an adjustable strap that can stretch up to 25 inches, the GORAUL collar is suitable for small to large dogs. While the collar has been quite popular among pet owners that prefer natural flea treatments because of its effectiveness, the manufacturer offers money back guarantee in case you don’t like it. Effectiveness – does it only kill or also prevent fleas? 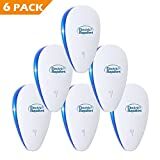 Is it only effective for fleas or targets others parasites as well? Does the flea collar kill parasites at all stages of their lifecycle? Using a flea collar is very simple. All you have to do is to put it on your dog’s neck and it will start working immediately. Keep it a little loose so your dog doesn’t feel trapped or suffocated. 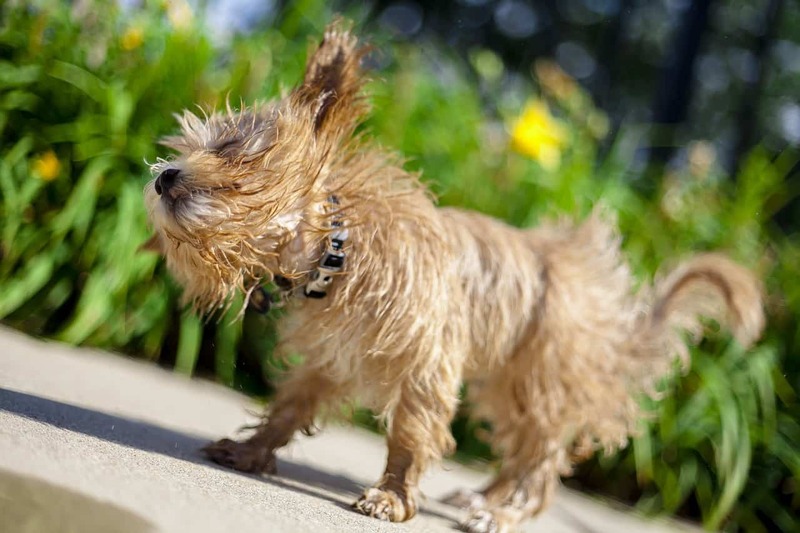 Also, remember to remove the collar (even if it is water-resistant) before bathing your dog or taking it for a swim as it can reduce its efficiency. 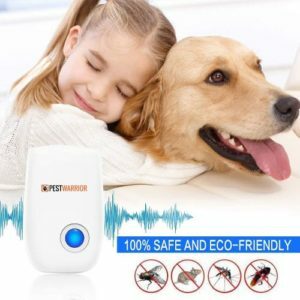 We have provided you a list of the best flea collars for dogs so that you can protect your dog from the tiny monsters that live on their bodies and make their lives miserable. Effectiveness – All the products that we have picked are highly effective for fleas and ticks. Safety – All the flea collars reviewed in this article are non-toxic and generally found to be safe for all dogs. While we have given safety a huge importance, there may be a few exceptions. Therefore, it is advised to always check the packaging to know what chemicals have been used in a collar and read the instructions to avoid any negative effects. Here, we have answered some of the most frequently asked questions about flea and tick collars for dogs. Take a look to find the answers to your queries or clear any doubts you may have. While dog flea and tick collars are highly useful for preventing a flea or tick infestation, they may need to be used along with another flea treatment product once there is an infestation. This is to make sure that all the fleas, their larvae, and eggs are killed and to reduce (or eliminate) the chance of a re-infestation. However, always consult an expert before using two flea treatment products together as excessive chemical exposure can affect your pet’s health. Although flea collars are generally a safer flea treatment option, they are not meant for puppies that are 3 months or younger. Some flea collars may not be suitable for pregnant, nursing, and old dogs. To prevent any problems, always read the information given on the package or consult a veterinarian to make sure it is safe for the dog you want to treat. While many tick and flea collars claim to be waterproof, experts are of the opinion that most of them are not 100 percent water-resistant and exposure to water can decrease their efficiency. Therefore, it is advised to remove the collar before taking the dog for a swim or bathing. Experts also advise to remove flea collars when taking your dog to a pond or sea because the chemicals present in them can be toxic for the sea life.